Enjoy a suitable vehicle that can fit your group size and luggage, where you can recline in comfort with ample space! Sitting on a plane for hours can be draining, and the last thing you want before you arrive or depart from the airport, is the hassle of getting a taxi. 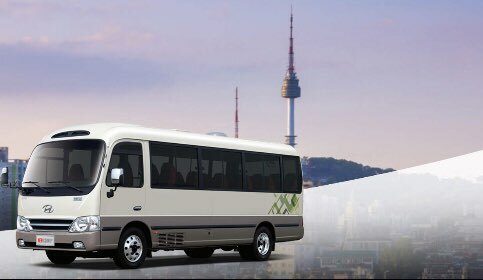 When you arrive in South Korea, don't let transportation be a problem with this simple and quick pick up service from Incheon International Airport to your hotel. Meet your driver near Gate 12, whom you can easily communicate with in English! Choose from a spacious car that can fit four people or a larger van can easily accommodate up to seven passengers. If you'd like to make your return journey hassle-free too, don't forget to also book the drop off package and let your driver pick you up directly from your hotel - the hassle-free way to wrap up your trip. Commuting between Incheon airport and Seoul has never been easier! Minibus with 25 seats (including 7 folding seats). Please contact Cosmojin in advanced if you have more luggages than maximum nunber.